We can all probably relate to knowing one person in our life that is quite difficult to buy for, whether for a birthday, or even a Christmas gift. Selecting the right gift for any occasion is often hard enough, especially when it's for a person who may already have some of the latest designer pieces. With just weeks before the holiday frenzy officially starts (or perhaps it already has), tech products are usually a safe department to select from for gifting for me. There's no fretting about sizing, and of course plenty of ways to personalise many tech accessories. And, when there's a limited edition of pieces, that's even better. 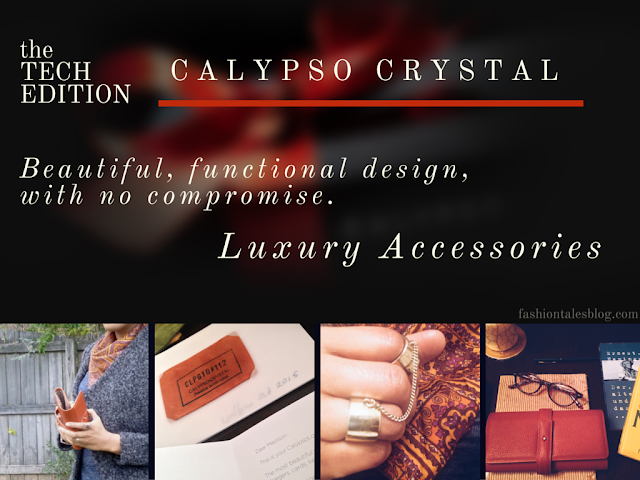 Calypso Crystal has a new collection that's full of bold patterns and colourful style options for your technical devices. I've partnered with the brand again to share one of their latest accessories, the CalypsoLoop. You may have remembered a few of my reviews of their luxe pieces from past collections, including the Mac laptop case, and mobile case. The Loop is a wallet or clutch-style case that holds your charger, earphones, cables, cards, and keys. 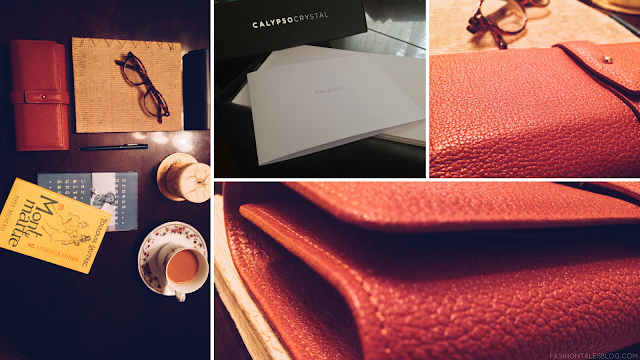 The case comes in fine Italian leather, and is sectioned with three compartments for storage. The interior has contrast colours in diamond jacquard fabric, and it's beautifully stitched with the solid Italian leather edging in the same colour as the face of the outer shell. As always, there is a limited number of each design made, 999 to be exact. Quite a posh, but practical way to keep all of your tech pieces in order and in style. There's even enough room to hold your iPhone. I was using the Loop quite a lot last month, which was really handy for travelling. You can ultimately keep your I.D. and keys for quick access when off to grab a coffee. Or, if you don't want to carry your handbag, it makes for a great quick clutch to hold a lipstick, credit cards, or fare cards for convenience, not to replace the good ol' satchel, of course! Just like your luxe shoes and protecting their soles, taking care of your personal tech pieces are also important for longevity. But, when choosing luxury pieces, it's certainly best for them to actually suit your lifestyle. And, if you're already spending a great deal of money on your mobile devices, why not discover quality accessories that will protect them in style? What do you think of the CalypsoLoop? How do you store your tech accessories on the go? The goods: CalypsoLoop in "Paris Glory"-c/o CalypsoCrystal. Not into bold colour? View the exclusive "Edition Black" line here. *Only 199 pieces from the "Edition Black" collection are made. Lole this jewelry colection as well as your outfit.